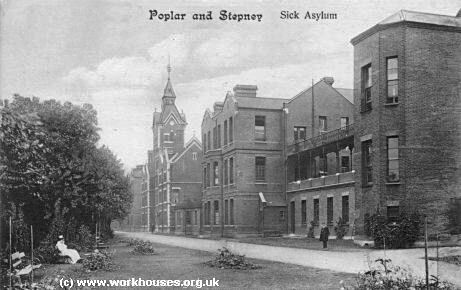 The Poplar and Stepney Sick Asylum District - a provision for London's sick poor. The Metropolitan Poor Law Act was passed in March 1867 to improve the provision of care for the sick poor in London, particularly through the provision of hospital accommodation separate from workhouse. The operation of the Act was overseen by the Metropolitan Asylums Board under which six new Sick Asylum Districts were created, one of which was Poplar and Stepney formed in 1868. The Poplar and Stepney Sick Asylum District included the parishes of Poplar, Bromley, Bow, Limehouse, Wapping, Shadwell, and Ratcliffe. The costs of building six completely new hospitals turned out to be prohibitive, and four of the new Sick Asylum Districts were reconstituted as enlarged poor law unions who would redeploy their existing accommodation. The Poplar and Stepney District survived, along with the Central London Sick Asylum District. 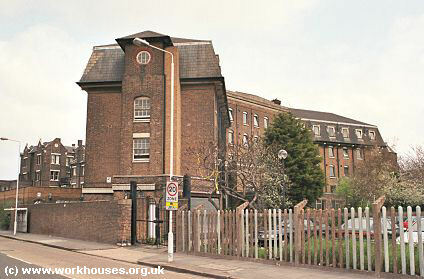 The new Poplar and Stepney Sick Asylum was erected in 1869-71 at Devon's Road in Bow, on a narrow 4.5 acre site immediately to the south of the Stepney workhouse. It opened its doors on August 17th, 1871, to serve "the sick, bedridden and infirm". The buildings, designed by A & C Harston, followed the example of the recently erected St Thomas's Hospital and were based on the pavilion system with separate blocks connected by corridors and bridges. A central administrative block contained offices, nurses' rooms, the boardroom and chapel, with kitchens and laundry to the rear. 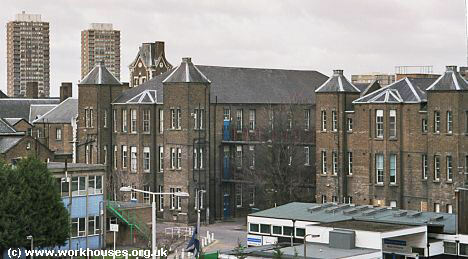 Poplar and Stepney Asylum central block from the north-east, 2004. 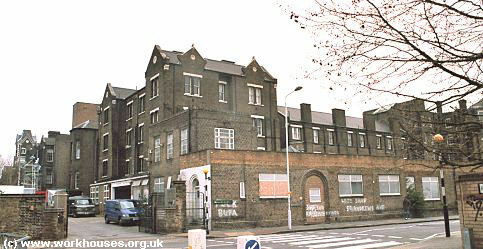 Poplar and Stepney Asylum from the south-east, 2004. At each side were placed two three-storey ward blocks, the inner ones being double-width wards with a central corridor. Male ward blocks were located at the west of the site and female at the east. 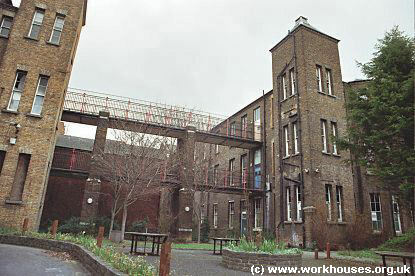 Poplar and Stepney Asylum female ward blocks from the south, 2004. Internal fittings included a system of electric bells, telegraphic communication, lifts to the wards, hot-water central heating, and large tubes in the walls to convey dirty linen from the wards to the basement. The total cost of the buildings was £432,000 and the site £7,800. The scheme was financed by a loan that was repaid of many years from the poor rates of the District. The hospital had a certified establishment of up to 572 beds and 26 nurses. The hospital opened with a single doctor and no trained nurses. In its first year, there were 2,094 admissions and 282 deaths. The first Medical Superintendent, Dr Robert William Goldie, was appointed in 1872. A school of nursing was established in 1875 and nurses followed a three year course for a certificate of training and sick cookery. Poplar and Stepney Asylum connecting bridge, 2004. Further ward blocks were added at east of the site in 1892, and other additions including a Y-shaped nurses' home at the south-west were made in 1893-6. 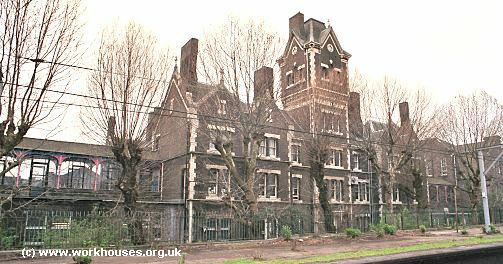 Poplar and Stepney Asylum 1892 extension from the east, 2004. 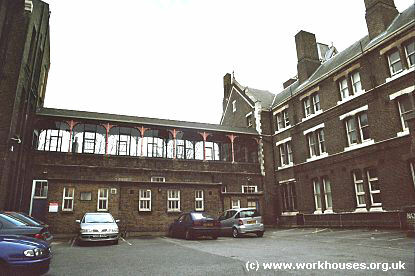 Poplar and Stepney Asylum nurses' home from the south-west, 2004. In 1908, the hospital was the centre of a scandal when six members of the Board of Guardians were found guilty of conspiracy to defraud the ratepayers. For several years, overpriced tenders work at the hospital had been regularly accepted from local builder called Calcutt, who had then given money to the guilty Board members. In 1920, the site was renamed St Andrew's Hospital after a nearby church destroyed during the First World War. Following the dissolution of the Poplar and Stepney Sick Asylum District in 1925, the hospital was administered by the Metropolitan Asylums board until 1933, when responsibility was transferred to the London County Council. More recently, the hospital has provided care for acute and geriatric patients but following its closure, all the buildings were demolished in 2008. London Metropolitan Archives, 40 Northampton Road, London EC1R OHB. Holdings include: Poplar and Stepney Sick Asylum District minutes (1868-1925); Various hospital records (1913-1948); etc. Royal London Hospital Archives and Museum, 9 Prescot Street, London E1 8PR. Holdings include: Admission and discharge registers (1873-1944, recording dates of admission, discharge, death, patient details, diagnosis and religion); etc. A Short History of St Andrew's Hospital by E Hacker, 1971.